This is the simplest recipe in the world. I share it with you because it’s so easy and delicious it’d be a shame not to have it in your repertoire. It’s basically fresh mango and a syrup (water and sugar) that you churn in an ice-cream maker. You can make it into a granita if you do not own this kind of machine. 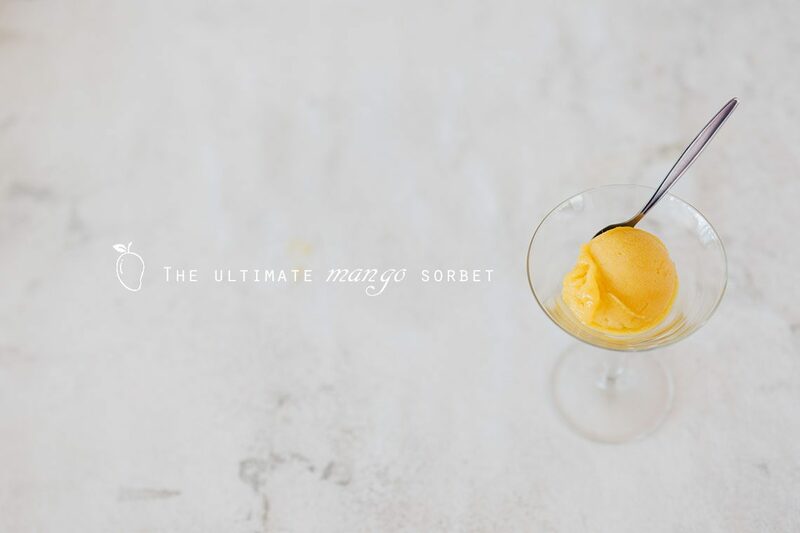 You simply pour the sieved mango pulp and syrup mix into a tray which you freeze. 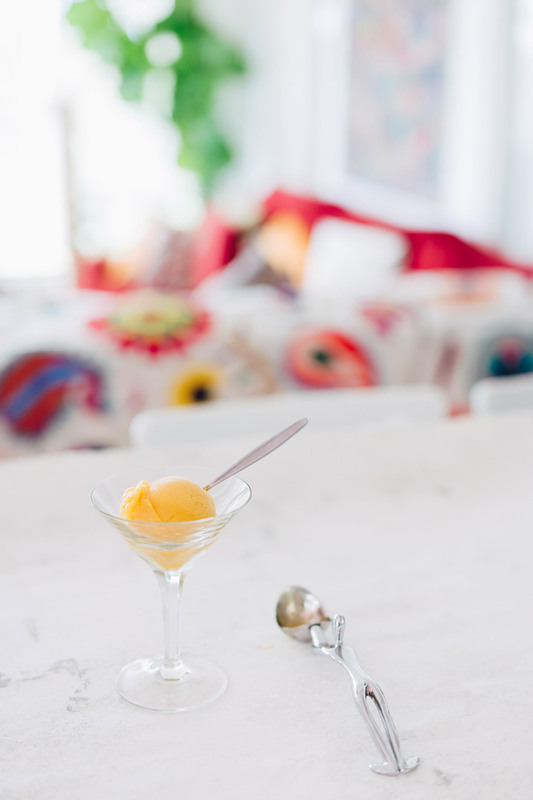 You then scrape the frozen sorbet with a fork and serve this in martini glasses. I cannot remember where I bought this ice-cream spoon. I always kept it at the far bottom of a deep cupboard being scared of ruining it. But for a few weeks, I have changed my way of seeing things completely. I reorganised my kitchen, emptied all the cupboards, sorted out what I wanted to keep, and which object should start a new life in another household. The trigger was the decision to unclutter my very very crowded kitchen by buying a few tall and low cupboards from Ikea. This allowed me to make my kitchen beautiful again, to pull out incredible treasures, to rediscover my french-fries-with-only-one-spoon-of-oil machine, my Dutch pancakes machine, my ice-cream compressor and this marvellous spoon. This is when I decided that life being short, what is the point of keeping the “good plates” in the cupboards and the arty spoon hidden somewhere. So I got gave away my basic white plates, bought incredibly colourful French plates, places my fruits on my bench in handmade ceramic treasures, I unearthed my crystal martini glasses (above) Wendell and I bought in a fabulous antique market in Antwerp. Since then, life has been much more beautiful. 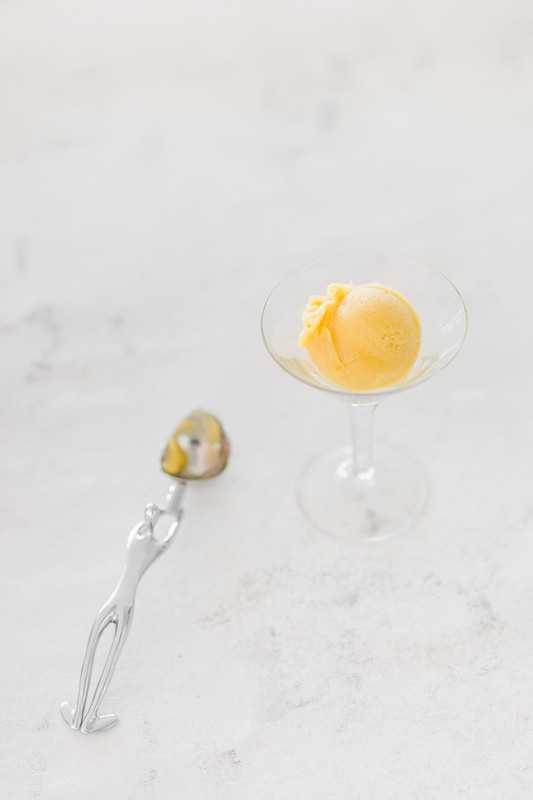 And to celebrate, we invited 13 people over and made a feast including this simple sorbet which I have been making for years. Make a syrup by simply bringing the water and sugar to the boil. Cool down until cold. Pass through a sieve to get rid of the furry bits, scraping with a spatula. Mix with cold syrup and pour into your ice-cream machine. Let it rest in the freezer for 1 hour before eating if you can resist its fabulous smell and texture. Keep it with plastic film over the sorbet (touching the surface). I would love to see photos of your newly organised kitchen. I am guilty of terrible over cluttering! Hahahaha :) Well the exterior kitchen is not a work of art…. far from it. It’s Celadon green, shiny and installed on the decking of our little shack. I’m probably too ashamed to show it! i adore your ice cream spoon! and i couldn’t agree more, life’s too short to keep the lovely stuff in cupboards. So nice to hear from you here. I can’t wait to see your ice-cream bomb. There is a huge list of recipes I want to make from your blog… Do you have the recipe of your famous bean paste with lemon?